London Nicole Breed (born August 11, 1974) is an American politician. She is the 45th and current Mayor of the City and County of San Francisco. She formerly was supervisor for District 5, and was president of the Board of Supervisors from 2015 to 2018. Breed became acting Mayor following the death of Mayor Ed Lee. She served in this role from December 12, 2017 to January 23, 2018. She won the special election a few months later making Breed the first black woman and second woman to be elected mayor of San Francisco. She was sworn in as mayor on July 11, 2018. ↑ Knight, Heather (13 June 2018). "It's a really big deal that SF elected London Breed as mayor". San Francisco Chronicle. Retrieved 13 June 2018. ↑ Melendez, Lyanne (11 July 2018). 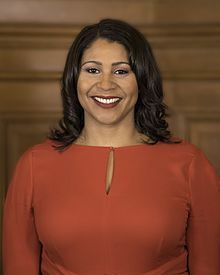 "San Francisco welcomes new mayor London Breed". ABC7 San Francisco. This page was last changed on 15 February 2019, at 17:00.